Use the link provided to view the painting of the week: Las Meninas. View Las Meninas closer by watching this YouTube video: Exploring Art-Las Meninas. Note: These lessons do not directly correspond with the artist from Option 1 or 2. In this year of Harmony Fine Arts you will finish the second half of the Artistic Pursuits Book (started in Year 2). Read Lesson 17 (pages 44-45) in Artistic Pursuits Grades K-3 Book Two on Albrecht Durer. Visit the Garden of Praise page for Durer. For the Parent: Read page 46 on printmaking. Complete Project 17 on page 47 which is a monoprint with ink. Listen to Water Music Suite 3 in G Major on YouTube. Click and print the Instruments of the Baroque Orchestra. View Baroque Dancers with Handel’s Minuet on YouTube. 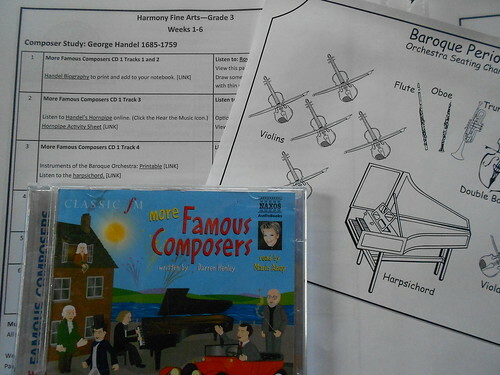 The plans give you specific music to listen to for Handel but you can always substitute any Handel CD you already own if you want to keep your expenses down. If you have older children, there are also middle school level art and music appreciation plans for Late Renaissance and Early Modern times and you can read about them here: Harmony Fine Arts Grade 7 Late Renaissance to Early Modern Art. Please note that Grade 3 and Grade 7 have different artists and composers so they will not “match” except in covering the same time period.